Sometimes it's refreshing when a band simply works their tail off week in and week out and you can see them trying to improve with each show and build their fanbase one person at a time. Lexington Down is that kind of band. They've been plugging away up and down the East Coast for several years now and will be celebrating the release of their first full-length CD, "Partial Possession Claim", at The Saint in Asbury Park, New Jersey on Saturday, September 15th. Keith Hann, Dan Palyca, Gerry Matthews and Chris Farrell comprise Lexington Down. They're regular players in both the Asbury Park and Atlantic City music scenes - a combination you don't see too often. It came about from having band members live in Monmouth and Ocean County and going to college at Richard Stockton in South Jersey. "We knew a lot of people from school," explained Gerry Matthews. "We would play shows down there and a lot of people would come out. Plus there's a couple of other bands that we know that have a bit of an all-ages scene going on down there in some fire halls and churches. We do really well with a younger audience." It's partly because of their younger fans that the band decided to make their new CD available online as a free download. It wasn't the easiest of decisions because they knew they had spent a lot of time working on the record and put a lot of money into the project, but when they looked at things closely they knew giving the music away would be better in the long run. "The truth is that if we are going to get to a point where our music sustains us - and I don't mean millions of dollars but being able to quit our day jobs and be able to work our asses off like we do now but not be on empty all day long - the amount of music we give away now will only lead us to that," explained Matthews. The plan seems to be working as the band's songs were played roughly 40,000 times on Purevolume.com and over 110,000 times on the band's Myspace site. "It's one of the beauties of web promotion," said Matthews. "A girl from Huntington Beach, California wrote us and said she downloaded our entire album and she loves us. That's just one person, but one person is enough when before that it was no people. And without us doing anything other than making it available, our album got on the West Coast. "Nobody knows who you are. You might feel like you've accomplished something and we do feel that way, but it's not that big in the true scope of things. People aren't that willing to take a chance on buying a band that they don't know and kids don't have credit cards for online orders anyway." 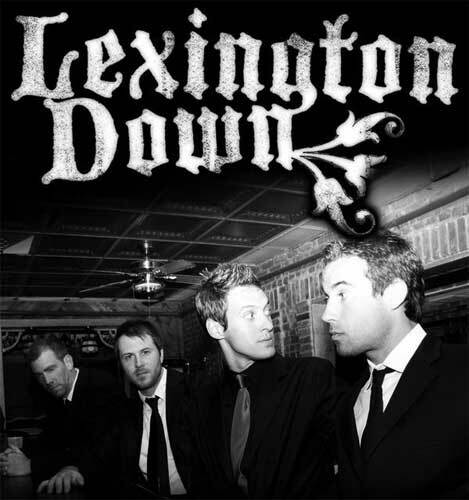 Lexington Down is like an old school band that wants to earn everything they get. While some bands stick close to their base - playing largely in front of their friends - Lexington Down enjoys winning over the crowd. Matthews said some of the band's favorite shows took place in the train stations and Elks Lodges of West Virginia where hundreds of kids would pack the place. All total, the band has played nearly 200 shows in the last three years. "We just want people to be able to listen and see what we're all about," he adds. The band's sound has been compared to bands like Jimmy Eat World, Death Cab For Cutie, and Fugazi. "Partial Possession Claim" is full of tunes that should find their way on to college radio stations in the next few months. The CD was produced by The Churchills, who have once again produced an incredibly slick, radio friendly disc. Check out the tunes yourself at www.lexingtondown.com and chances are you'll become a fan as well. The list is growing one name at a time, just the way they like it.